Paul Preston’s new biography of Santiago Carrillo, the legendary Spanish Communist leader, stirred up serious controversy when it came out in Spain last year. It will be available in the US in February. In this exclusive excerpt, Preston recounts Carrillo’s involvement in the 1944 attempt to invade Spain from France. 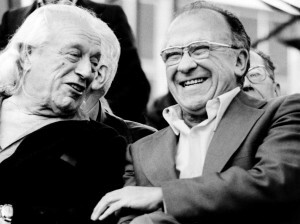 Editors’ Note: Having left Spain during the Civil War, Santiago Carrillo spent much of World War II on missions for the Communist International in Moscow, New York, Cuba, Argentina, and Uruguay. In 1943 he joined the political bureau of the Spanish Communist Party (PCE), led by Secretary General Dolores Ibárruri (Pasionaria). The Party’s leadership in exile insisted on wielding authority over the Communist resistance in Spain but its lack of awareness of real conditions in the country led to frictions with the anti-Franco resistance in Spain—and to strategic mistakes such as the failed attempt to invade Spain from the north in October 1944, through the Val d’Aran. 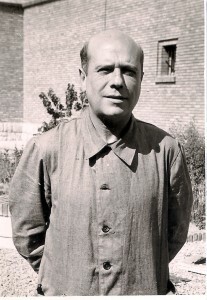 In his efforts to deny responsibility for this military disaster, Carrillo unleashed a witch-hunt against Jesús Monzón, a central figure in the Communist resistance in Vichy France during much of World War II, alongside Manuel Azcárate and Carmen de Pedro. In 1943, Monzón had returned clandestinely to Spain to create a broad anti-Francoist coalition, the Junta Suprema de Unión Nacional (Supreme Council of National Unity). The following abridged excerpt of Preston’s book finds Carrillo in the Algerian city Oran in August 1944, hoping to reorganize the Communist Party within Spain. Jesús Monzón in the Teruel prison. Photo courtesy of Elvira Gómez Urrutia. His idea was totally unrealistic and typical of what was to be his hallmark, his triumphalist rhetoric. It is true that, within a few months of the end of the Civil War, there was a significant number of guerrilleros in rural, and especially mountainous, areas. There it was easier to hide, to avoid the patrols of the Civil Guard and even to find the wherewithal to live, if not with the help of sympathetic peasants, at least by means of hunting and collecting wild fruit. As in other twentieth-century guerrilla wars, the principal activity of the huídos was defensive, their initial objective simply survival. 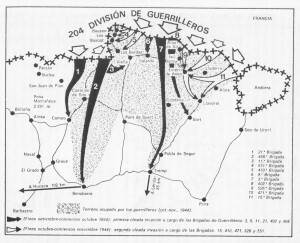 Unlike their Chinese and Cuban counterparts, the Spanish guerrilleros had little possibility of establishing liberated zones that might have served as bases for the future struggle against the regime. The only places sufficiently remote from the forces of repression to permit any possibility of establishing autonomous revolutionary communities were in the most inhospitable parts of the peninsula. Moreover, the depressed circumstances of the defeated Spanish left between 1939 and 1944 were hardly propitious for a revolutionary war. The repression, hunger, families destroyed by death and exile and, above all, the intense weariness left by the titanic struggles of the Civil War ensured that there would be no popular uprising in support of the huídos, who were condemned to a hard and solitary existence. Carmen de Pedro (right). Photo courtesy of Irène Tenèze. Occasionally they were able to emerge from their defensive positions. Attacks were carried out against Civil Guard barracks, local Falangist offices, and Francoist town halls. It is absurd to suggest, as Enrique Líster did in 1948 and the official Party history was still doing in 1960, that the guerrillas had sufficient troops to prevent Franco entering World War II on the Axis side. Nevertheless, the activities of the huídos were a constant irritant for the regime. (2) In so far as the controlled press mentioned their activities, it was to denounce them as acts of banditry and looting. However, in some rural areas, the activities of the guerrilleros had the effect of briefly raising the morale of the defeated population until the savage reprisals of the forces of order took their toll on popular support. It was understandable that thousands of Spanish maquisards who had been prominent in the French resistance had responded to progressive German collapse by moving towards the Spanish frontier, hopeful that Franco might be next. In his memoirs, Carrillo claimed that on his arrival at PCE headquarters in Toulouse he learned from Azcárate and Carmen de Pedro that the Agrupación de Guerrilleros Españoles had received orders for the attack through the Pyrenees from the Junta Suprema de Unión Nacional. Of the Junta, he would sneer 50 years later that it “existed only in the imagination of Monzón.” He forgot that, at the time, it certainly existed in the imaginations of Pasionaria, Vicente Uribe, and the rest of the PCE politburo, including himself. Indeed, his ostensibly cordial correspondence with Monzón both before and after the invasion suggested that he also believed firmly in the Junta Suprema. […]. 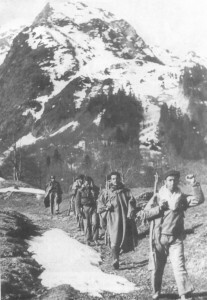 Group of Spanish guerrillas in the Pyrenees. Manuel Azcárate wrote later that, when Carrillo arrived in the south of France, “his intentions towards Monzón were malicious. He wanted to ensure at all costs that Monzón’s indisputable achievements should not receive the credit that they deserved.” In fact, far from opposing Monzón’s illusion that an incursion of guerrilleros would trigger a popular insurrection against Franco, Carrillo shared it. Indeed, he hoped to take some, if not all, of the credit. […] Monzón was far from alone in his readiness to risk the PCE’s greatest asset, its thousands of battle-hardened maquisards, in a conventional military confrontation with Franco’s forces. After all, with the Germans facing defeat, it was an attractive option. Carrillo, as his account of his preparations in Algeria suggested, may have also favored a strategy of starting a guerrilla war by sending small groups into Spain over a long period. Nevertheless, his fictionalized account of the origins of the Val d’Aran operation dramatically exaggerates the differences between himself and a supposedly out-of-control Monzón. As Pasionaria’s response to Carrillo’s own plans for a smaller-scale invasion from the south had indicated, the idea of a guerrilla war was approved by the PCE leadership in Moscow as well as by the delegation in France [..]. Carrillo’s attitude towards Monzón can be understood only in terms of his own burning ambition. The detailed military planning of the invasion was the work of the Spanish heroes of the French resistance, Luis Fernández and Vicente López Tovar. Beginning on October 19, 1944, approximately 5,000 men of the invading army began to enter Spanish territory through the Pyrenees with the principal attack focused on the Val d’Aran. Snow-covered for most of the year and sparsely populated, it was an area of shepherds and woodcutters, a place barely appropriate as the base or foco of a popular uprising. Despite the ostentatious military structure set up by the Communist leaders of the maquis, the invasion was essentially improvised. It disregarded the obvious fact that a conventional military incursion played into the hands of Franco’s huge land forces. Nonetheless, over the next three weeks, the invaders chalked up a few successes, some units penetrating over 60 miles into the interior. In several individual actions, they roundly defeated units of the Spanish Army and held large numbers of prisoners for short periods. In the last resort, however, 40,000 Moroccan troops under the command of experienced Francoist generals […] were too much for the relatively small army of guerrilleros. […] The invaders’ hopes of triggering off an uprising were always tenuous. Deeply demoralized, the Spanish left inside Spain had still not recovered from the trauma of defeat, was ground down by fear of the daily repression and, finally and most importantly, was only distantly and vaguely aware of what was happening in France. The regime’s iron control of the press and the minuscule circulation within Spain, at least, of Monzón’s clandestine broadsheet La Reconquista de España ensured that the guerrillero invasion took place amid a deafening silence. 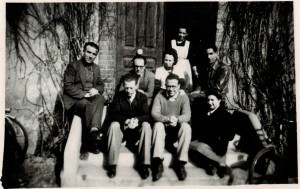 Rafael Alberti and Santiago Carrillo at the Casa de Campo in Madrid. 1978. Photo Nemo. CC BY-SA 3.0. 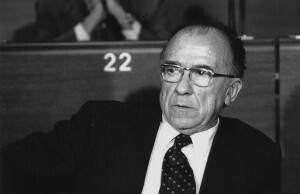 Carrillo claims that, when he heard of the operation in Toulouse, he drove frantically to the Val d’Aran to try to stop it but unfortunately found that the invasion had already started. He must have been one of the few people in France or indeed in the PCE leadership in Moscow not to have heard about it, all the more so since he had been in France for several weeks before the attack was launched. It is much more likely that he went to Aran with the intention of sharing the glory if the operation were a success or being in a position to blame Monzón if it were a failure. In his fanciful reconstruction, acting on his own initiative he was able to persuade the leaders that he had been sent by the PCE leadership in Moscow to convince them that the entire operation was madness. There is little doubt that he was acting on his own initiative, and there is reason to suspect that his intention was not so much to prevent a failure as to undermine the position of Monzón. The enthusiastic cooperation of the French resistance ensured that the invading forces were initially well equipped with supplies of food, fuel, light arms, ammunition and vehicles, most supplied by the Allies. However, they were massively outnumbered and outgunned, especially once their ammunition began to run out. The guerrilleros of the invading force were already on the point of retreat and needed no persuasion from Carrillo. On February 6, 1945, Carrillo dispatched a report to Pasionaria in which malice and invention sat side by side. He described the PCE’s situation in such wildly optimistic terms as to make it seem that the overthrow of the regime was imminent. By implication, if this had not happened, it was Monzón’s fault for failing to link up the many groups all over Spain allegedly ready to rise up. He claimed that the Junta Suprema was “continuing to grow in popularity and prestige.” He went on to give an entirely mendacious account of the Val d’Aran episode in which claimed that the guerrilla leaders had not wanted to take part and did so only out of reluctant obedience to Monzón. He praised himself for avoiding a bloodbath. Because of Monzón’s poor preparation of the invasion, he claimed, three valuable months had been lost that could have been used to prepare a nationwide insurrection within Spain. He then accused Monzón of running the interior delegation in a tyrannical fashion in cahoots with Pilar Soler [a PC militant in Spain who had become Monzón´s lover] and [Gabriel León] Trilla [a veteran Party member and resistance fighter] and suggested that this group was close to acting against the Party. Operation Val D’Aran, Oct. 19-27, 1944. Paul Preston is Príncipe de Asturias Professor of Contemporary Spanish History at the London School of Economics and Director of the Cañada Blanch Centre for Contemporary Spanish Studies. The Last Stalinist, his biography of Santiago Carrillo, can be pre-ordered here. 1 Moran, Miseria y grandeza, pp. 96-7; Carrillo, Demain I’Espagne, pp. 80-3; Carrillo, Memorias, pp. 394-406; Claudln, Santiago Carrillo, pp. 76-8. 2 Enrique Lister, ‘Combates y experiencias de la Agrupacion Guerrillera de Levante’, Nuestra Bandera, No. 24, January-February 1948, pp. 25-32, and ‘Lessons of the Spanish Guerrilla War’, World Marxist Review, February 1965, pp. 35-6; Ibarruri et al, Historia del Partido Comunista de Espana, p. 220. 3 Dolores Ibarruri, Memorias de Pasionaria 1939-1977: mefaltaba Espana (Barcelona: Editorial Planeta, 1984) pp. 86-7; Carrillo, Memorias, pp. 407-10. 4 Carrillo, Memorias, pp. 411-13. 5 Carrillo to Monzon, 27 July,Monzon to Carrillo, 2 August 1944, AHPCE, Caso Monzon, Correspondencia/Sign. Jacq 10. Adela Collado was the partner of Manuel Jimeno, one of Monzon’s closest collaborators – Mariano Asenjo and Victoria Ramos, Malagon: Autobiografia de un falsificador (Barcelona: El Viejo Topo, 1999) p. 103. 6 Dolores Ibarruri, ‘El movimiento guerrillero vanguardia de la lucha por la reconquista de Espana’, 20 September 1944, AHPCE, Dirigentes/Dolores Ibarruri/ Escritos, 16/2. 7 Azcarate, Derrotasy esperanzas, pp. 281-7; Fernandez Rodriguez, Madrid clandestino, pp. 334-43; Fernanda Romeu Alfaro, Mas alia de la utopia: Agrupacion Guerrillera de Levante (Cuenca: Ediciones de la Universidad de Castilla-La Mancha, 2002) pp. 25-6; Ruiz Ayucar, El partido comunista, pp. 80-1;Carrillo, Memorias, p. 413; Claudin, Santiago Carrillo, pp. 78-9; Carrillo, Demain lEspagne, pp. 95-8. 8 Telegram from Carrillo to Ibarruri, October 1944, AHPCE, Dirigentes/ Santiago Carrillo/Dirigentes – Correspondencia – Movimiento Guerrillero/Microfilm/Sign. Jacq. 9. 9 Carrillo, Report to Ibarruri, 6 February 1945, AHPCE, Dirigentes/ Santiago Carrillo/Informes/Caja 30, carp. 1.2. 10 Moran, Miseria y grandeza, pp. 102-7; Martorell, Jesus Monzon, pp. 157-64; Taguena Lacorte, Testimonio, p. 541. 11 Asenjo and Ramos, Malagon, p. 150. 12 ‘Informe de Pilar Soler sobre la Junta Suprema de Union Nacional y sobre Monzon’, December 1945, AHPCE, Caso Monzon, Informes/ Jacqs. 84, 85, 86, 87, 88 and 89; Pilar Soler interview with Emilia Bolinches in 1998; Arasa, La invasion, p. 381. 13 Fernanda Romeu Alfaro, El silencio roto: mujeres contra elfranquismo (Madrid: Edition de la autora, 1994) pp. 154-5; Martorell, Jesus Monzon, pp. 183-90; Arasa, Anos 40, p. 300; Carmen de Pedro, Report on Monzon, Toulouse, 5 August 1945, AHPCE, Caso Monzon/Caso Monzon/Jacqs. 46 and 47. 14 Fernandez Rodriguez, Madrid clandestino, pp. 347-60; Arasa, La invasion, pp. 373-87; Arasa, Anos 40, pp. 294-7; Martorell, Jesus Monzon, pp. 172-82; Moran, Miseria y grandeza, p. 106. Thanks for the article. I was unaware of even the fact that this military offensive even occurred. While not surprised at the betrayals and set ups, I am thankful to have learned about this . The snippet published here is disturbingly filled with sneer and innuendo. Is there a less attack-dog version of this? I know nothing of Santiago Carillo’s actions in the period. What guidance and direction was the Communist international providing? Did it approve of the 44 attempt?